The Gavia Bridge was situated nearby the Gavia Hill, 7,5 km after the Headwaters, between the Fourth and Fifth Locks. This element was the last disappearing from the Canal, some years ago. It was preserved until the construction of the High Speed Train AVE to Sevilla in the 90’s, in which works this bridge was destroyed. This bridge is mentioned in most of the texts from its time, but there are not extensive descriptions about, and apart from that, there is no further information from this bridge; designs or detailed plans are unknown, but fortunately was photographed around 1984, and we still have those images. The Gavia Bridge was already built in the first époque –around 1775-77 –in order to make the Gavia Stream crossing over the Canal, and taking the opportunity to have a wide crossing point for carts and animals, as the bridges over the locks were no wide enough. We know the bridge was rebuilt in 1818, in the second époque, as many elements of the already Royal Canal. 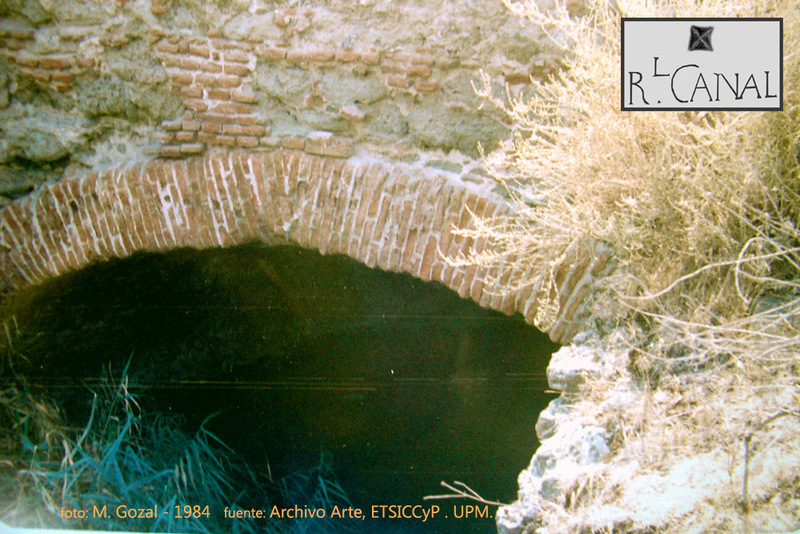 From this time it won the aspect we can see in the old photos: a bridge built in brick and masonry, very similar to the Congosto Bridge, built three years later in the municipality of Vaciamadrid. After that, the bridge is mentioned by Madoz in his description of the whole complex, but saying nothing interesting about it. Those are the last news we have, and they date from 1848. It is really a shame that in our modern times, in which we are supposed to be more sensitive to the History, we have destroyed it without any kind of qualm; even more if we think it survived over more than a century and a half without cares, until our thoughtless times.